Twenty-nine years after its release, Young Marble Giants’ legendary ‘Colossal Youth’ (on Rough Trade Records, recorded in 1980 in five days and mixed in 20 minutes) remains a landmark in post-punk music, an enigma of its own, acclaimed by musicians and audience over the years. Formed in 1978 in Cardiff, the trio’s music was constructed around the powerful and minimal instrumentation of brothers Philip and Stuart Moxham on bass and guitar, supporting the naive untrained vocals of Alison Statton. 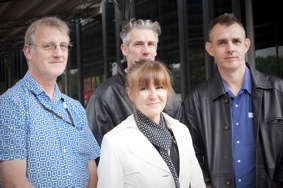 The band split in 1980, reformed in 2006 for a world-wide serie of amazing shows (with Julie Tippex!) and called it a day in 2015. 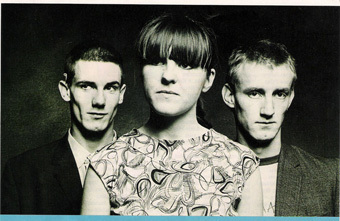 In the 80s, after Young Marble Giants, Stuart played with The Gist, Alison with Week End and Spike. The big news in 2018 is that, following the reissues by the label Tiny Global Productions of The Gist and of Alison and Spike’s new album, the three of them decided to go back on the road. So join us for ‘An Evening of talk and music with Stuart Moxham and Alison Statton, formerly of Young Marble Giants, and Spike, formerly of Weekend’. The first show was in Barcelona in 2017 at the Primera Persona festival ; Aliso, Stuart and Spike played an acoustic showcase of some of their old songs. They also took the time to tell the story of that mysterious and cultish band whose carrer went like a meteor. You can now watch a video of that show. 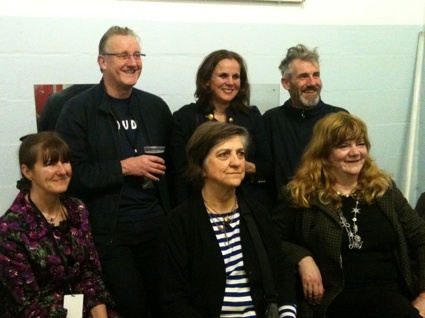 Left to right: Alison, Stuart (YMG), Anna, Anne (Raincoats), Phil (YMG) and Gina (Raincoats). 27 August 2015: Meltdown Festival curated by David Byrne, Royal Festival Hall, London – the final show.